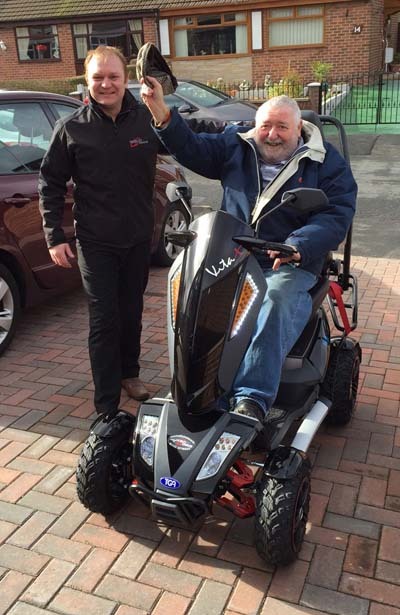 Joe Bannon, 71 from Greater Manchester, has been a life-long fisherman who despite recent mobility difficulties, has been able to access his local riverbanks once more thanks to a new type of off-road TGA Vita X mobility scooter from Mobility Choices. Joe grew up in Clayton and now lives in Denton – both in Greater Manchester. He began fishing with his Grandad when he was aged five. He has always found this pastime so rewarding and with over 60 years of experience, Joe has become highly competent at catching local carp on the Stockport branch canal and local ponds. Before retiring Joe spent the majority of his career as a successful lift engineer, however in recent years health problems including lung cancer and a heart attack, have led to severe difficulties with walking. He previously had chosen to try and tackle towpaths and fields on a small ‘shopping style’ scooter however this regularly got stuck-in-the- mud. Being able to continue his beloved fishing was becoming impossible. This was until Joe discovered a rugged 8mph Vita X mobility scooter when visiting Mobility Choices, also based in Denton. Mobility Choices are one of Manchester’s leading mobility product specialists that provide independent living solutions. These include mobility scooters such as the rugged TGA Vita X which resembles more of a ‘cool’ quad bike than a traditional mobility vehicle. It has black dynamic styling, LED lights, active suspension, high grip off road tyres and even a bucket sports seat. Joe’s fishing companion is now building a trailer for him so that he can tow all of his tackle. He will also be able to attach a fishing basket to his Vita X so beating his record of landing an 18lb carp is a distinct possibility.